If panic sets in as you realize you have spent your entire budget on a laptop, speakers and DAW package, you may be on a desperate search for a good MIDI keyboard controller at a wallet-friendly price. 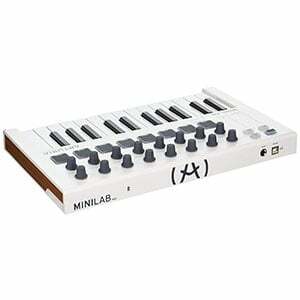 Enter, the MiniLab MkII 25, from Arturia. This compact keyboard controller offers plenty of features for not much cash – but does it cut corners elsewhere? Let’s find out. It is clear that Arturia has designed the MiniLab MkII 25 with portability in mind – at just 14” wide and 8.7” deep, and 1.5kg in weight, it is very easy to move around and slip in a backpack (it’s around the size of a laptop!). This makes it perfect for both artists on the go and those trying to make music in a small studio space. Cosmetically it is nothing special, but the overall design is very fresh, with a simple black or white casing, with grey control knobs and pads (these are RGB backlit, and look pretty awesome in low light). The white version in particular looks particularly fresh, and – while white is a dangerous color for busy studios and sets – it’s nothing that a wipe down can’t solve. Overall it has a great feel, with outstanding build quality. For around a hundred bucks, this is an impressive little machine. This feeling of admiration stretches into the feature department. For a small and – dare we say it – cheap machine, the MiniLab MkII 25 is pretty packed with features. Taking centerstage are the 25 velocity-sensitive slim keys, which are exactly as they are described – thin and small, but responsive. Above these sit eight velocity and pressure-sensitive touchpads which are pretty standard but functional, as well as accurate Pitch Bend and Modulation touch-sensitive strips. You will also find two rows of multi-function assignable encoders (there are 16 in total, with two being clickable) which you can control your DAW with. As for I/O options, you have a USB 2.0 port and a footswitch input (the footswitch is not included). A bonus is that this controller comes with 5,000 analog sounds built in, as well as some included software: Analog Lab Lite, Ableton Live Lite, and UVI Grand Piano Model D. Nothing too groundbreaking – especially if you already own DAW software – but more than enough to get you started. 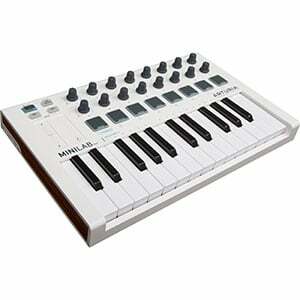 Overall, the Arturia MiniLab MkII 25 is built to perform, with a sensible layout that is simple to get to grips with. The keys are slim, which is great for size and portability, although they can feel a little restricted at times, especially if you are trying to play with a fast tempo. Still, if you are working in cramped conditions, the size and sensible layout of this controller – combined with the rugged and accurate feel of the chunky controls – makes for an easy workflow. Meanwhile, even though the bundled software are lite versions, the UVI Grand Piano Model D feels like the highlight, offering you an authentic hit of the famous Steinway Model D grand piano. For the price, this certainly enhances the offering. For such an affordable MIDI controller, the MiniLab MkII 25 is an impressive piece of kit. It’s clean, compact and easy to use, making it excellent for beginners. It doesn’t offer the most comprehensive package – and 25 keys may not be enough for more experienced music makers – but it does give you everything you need to start creating good music. 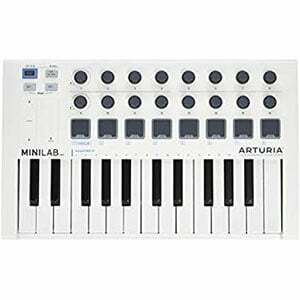 For more info about the Arturia MiniLab MkII 25, click here.